Would you want to tangle with this guy on an airplane? Periodically, you hear interesting stories about people who find themselves getting kicked off of plane flights for spurious reasons. From threatening tattoos to talking on the phone to Words With Friends, it seems like any number of reasons can cause a passenger to be removed from a plane, but most of these events happen on the ground. Very rarely do they happen in the air. Fortunately, when a passenger threw a fit on an American Airlines flight from Dallas-Fort Worth Airport to Santiago, Chile, there was someone big and intimidating to calm things down. 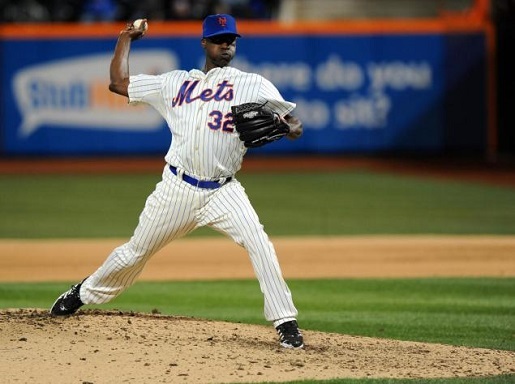 Mets relief pitcher LaTroy Hawkins (6’5) and his traveling partners restrained an unruly passenger during a plane flight. Talk about relief pitching! “We had to subdue a guy who was upset about not being able to sit in an open seat in business class. He and flight attendant started wrestling and fell into my lap. The (flight attendant) said he needed help,” Hawkins told the New York Daily News via text. Hawkins and his traveling partners were able to hold the passenger down as restraints were applied to keep him from rampaging through the cabin. I can only imagine it wasn’t the best flight imaginable for all involved. Possibly due to the passenger, the flight made an unscheduled stop in Lima, Peru, before continuing on to Chile. Presumably, Hawkins and his traveling partners Rodney Carter and Leonard Whittenberg continued on over the border to Argentina and their planned dove hunting expedition.